Made to the highest standards of precision and ease of installation. Along with Schaller‘s famed precision the new LockMeister Tremolo offers a second-to-none C45-steel ground plate, forged and hardened in Germany, resulting in improved sound and sustain as well as superior tremolo performance and intonation. New technologies enabled Schaller to craft all components in unprecedented tolerances giving the Schaller LockMeister Tremolo a sublime level of workmanship and longterm quality. Performing meticulous assessments they identified the perfect choice of pivot screws and tremolo springs. Through more rigorous testing they learned how all burnished surfaces were prone to corrosion. That‘s why all studs, inserts and screws of the Schaller LockMeister Tremolo now feature black-zinc and black chrome finishes for improved look, touch and durability. All this resulting in world famous Schaller longevity. Special studs with additional inserts are used to mount the tremolo onto the instrument. The inserts have a fine thread. Schaller also supply studs with threads which enable the studs to be specify screwed into the wood body of the instrument directly, i.e. without inserts. The dimensions of the Tremolo LockMeister are exactly the same as the dimensions of both the Floyd Rose Tremolo and the Schaller Tremolo. 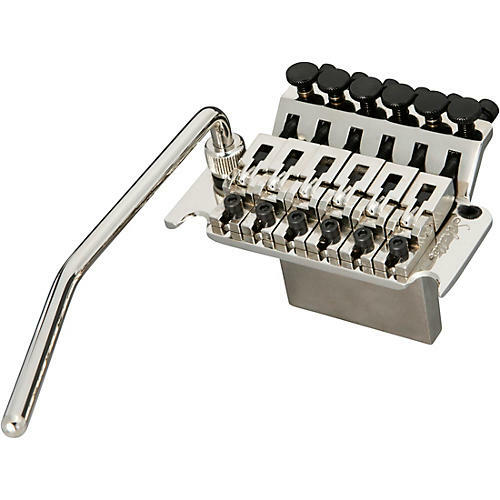 You can easily replace your Floyd Rose Tremolo or your Schaller Tremolo with the LockMeisterTremolo. This also applies to all replacement parts. Experience the new Schaller LockMeister. Order today.